What happens when women in midlife step out of what's predictable? For Bernadette Murphy, learning to ride a motorcycle at forty-eight becomes the catalyst that transforms her from a settled wife and professor with three teenage children into a woman on her own. The confidence she gained from mastering a new skill and conquering her fears gave her the courage to face deeper issues in her own life and start taking risks. It is a fact that men and women alike become more risk averse in our later years --which according to psychologists and neuroscience is exactly what we should not do. And Murphy stresses that while hers is a story of transformation using a physical risk, emotional and educational risks can serve the same beneficial purpose for other women. Murphy uses her own story to explore the larger idea of how risk changes our brain chemistry, how certain personality types embrace dangerous behavior and why it energizes them, and why women's expectations change once estrogen levels drop after the childbearing years. She also explores the idea of women and risk in pop culture--why there are so few stories of the conquering heroine (instead of hero). Surely Thelma and Louise driving off the cliff should not be our only pop culture reference for women finding true freedom. 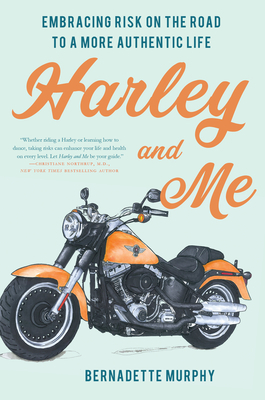 With scientific research and journalistic interviews weaving through a page-turning, road trip narrative, Harley and Me is a compelling look at how one woman changed her life and found deeper meaning out on the open road. Bernadette Murphy has published three books of creative nonfiction: The Tao Gals' Guide to Real Estate (with Michelle Huneven); The Knitter's Gift; and the bestselling Zen and the Art of Knitting (2002) in which she uses memoir and reportage to explore the connection between fiber arts, creativity, and spirituality. She served for six years as a weekly book critic for the Los Angeles Times. Her personal narratives and essays on literature have appeared in The Rumpus, The Nervous Breakdown, Manifest Station, BOOK Magazine, Ms. Magazine, LA Weekly, San Francisco Chronicle, San Jose Mercury News, Los Angeles Times Magazine, and elsewhere. She currently serves as core faculty in creative nonfiction at the Antioch University Los Angeles MFA program. Learn more at bernadette-murphy.com.